They are not deliciously fragrant and exquisitely overpriced bulbs dug up by pretentious French pigs. They are not destined for lovers and red boxes tied with silk ribbons. They are not dusted with cocoa or filled with ganache. They are not any of those things, which means that this title is utterly misleading, but then again, "miniature cheese balls" just did not have quite the je ne sais quoi I was looking for. These little pseudo truffles are your new best friend. I think we can all admit to knowing in our heart of hearts that the cheese ball is a bit tired. However, tired though it may be, I do love a good cheese ball. So here I am marching through your computer screen with the solution. Charcuterie may have currently stolen the spotlight, but there is no reason why we cannot continue in our lasting love affairs with nut-encrusted cheese, we just need to posh it up a bit. These little truffles have all the charms of a classic, Martha Stewart cheese ball but are ever so much more elegant. And frankly, just so darn cute. I know it's a little early, but I would to put a bug in your ear for inviting these little darlings to your Thanksgiving appetizer spread. Did I mention the fact that they are really, really easy to make? 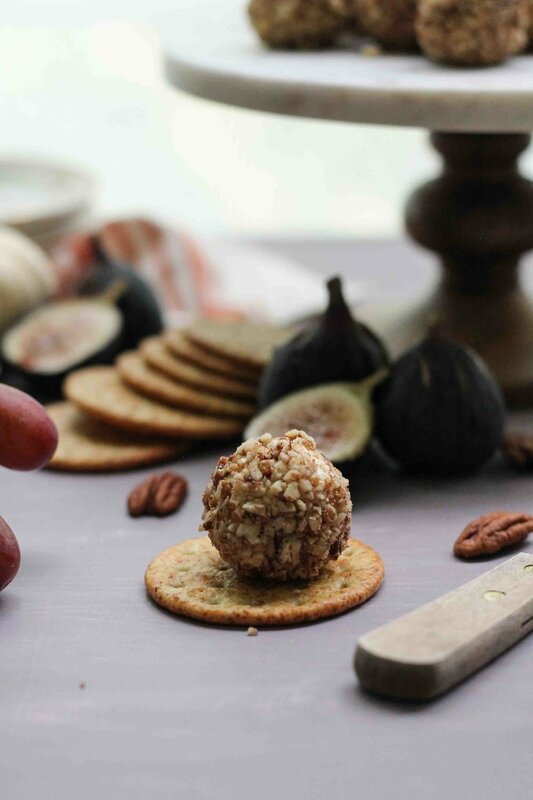 Sure, a bit more time intensive than a typical cheese ball, but definitely manageable. They also sneakily stretch one block of stilton pretty far thanks to the help of cream cheese, so they are a fabulously inexpensive foundation for a cheese board. 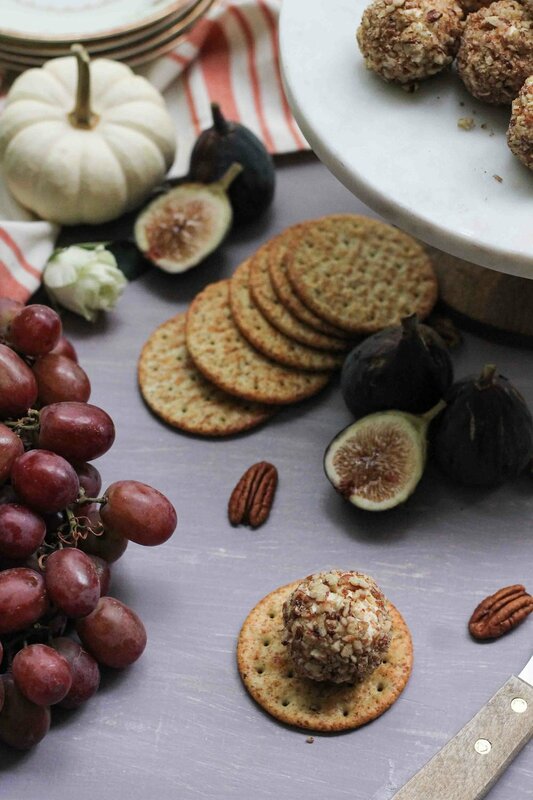 Gather some figs, grapes, apples, olives, and throw some crackers about and bam! Who even cares about the turkey now? Cook’s note: You may use any stilton you wish. Blue is always a good choice, but for these my favorite is an apricot or cranberry stilton. In the work bowl of your food processor combine cream cheese, stilton, onion powder, and nutmeg; pulse until smooth. Transfer the mixture to a bowl and cover with plastic wrap. Refrigerate for one hour; until firm. While the mixture is chilling, prepare the pecans. Pour the pecan halves into a medium sauté pan and toast until fragrant over medium heat. This should take about 3-5 minutes. Pour the pecans into the cleaned work bowl of your food processor and pulse several times to finely chop. Prepare a baking sheet by lining with parchment paper. Use a small, 1-ounce spring-loaded disher to portion out the cheese mixture, shaping them into balls. Roll each ball into the chopped pecan mixture and lay them out onto the baking sheet. Cover with plastic wrap and refrigerate until ready to serve. Serve at room temperature alongside crackers and fresh fruit. Enjoy!